and by Sphere Books, London. 1985. The Out-haul is set in a small village in west Cork known as BallyC, which is not unlike Ballydehob where I spent 3 winter months in 1982. The cast are mainly incomers of one sort or another, and there is a widespread notion that some of these can be identified with real people. I should be flattered really, as they are all imaginary. Except for Julia, the kindly bar owner, whom many people have recognised as Nell Levis, who died in March, 2013 aged 104. It is a rather darker book than A Joke, in spite of probably having more actual jokes in it. Its working title, while I was writing it, was Dark Corners. 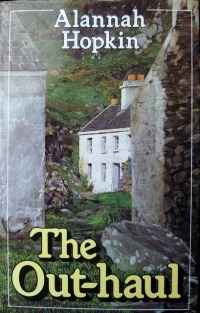 Whatever its merits as a novel, it stands as a record of how things were when west Cork was still a quiet backwater, and hardly anybody had any money. It would be nice to get it back into circulation: if you read it and like it, please let me know.